The holidays are almost here, which means it’s the season of giving, cheer and yes… buying. With so many people out and about shopping for that special someone on their list, businesses use this time to effectively market their product or service and boost sales. For some businesses, the winter months generate enough revenue to keep them running throughout the rest of the year. With everyone hosting sales, how can you stand out from the crowd this season? Today we look at seven happy holiday marketing tips for businesses and individuals alike. 1. Try out social media ads. If you or your small business are on social media, try using the holiday season as a way to test out social media advertisements, such as on Facebook or Instagram. While organic posts can definitely drive traffic, putting some money into holiday ads is a great way to stand out on social networking sites. Email is always an effective marketing strategy, so get creative this holiday season by including more personal and cheerful touches in your email marketing. 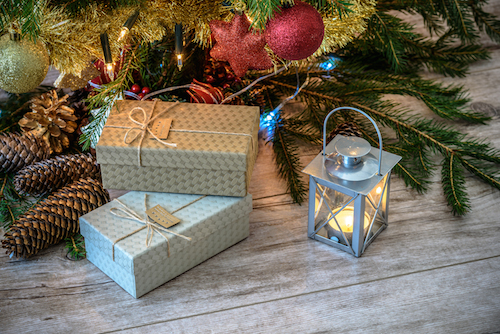 The holidays are an excellent time to promote camaraderie and nostalgia, giving you a way to connect with your customers and potential consumers. 3. Set up landing pages. Create valuable landing pages for website visitors and those interested in your product or service. Landing pages can advertise any sales you have over the holidays, and also collect insightful information on your visitors. Plus, landing pages are a fun way to be more interactive over the holidays without having to make drastic changes to your website. 4. Send personal holiday cards. Everyone loves getting holiday cards in the mail, so why not connect with consumers on a more personal level? Send out holiday cards thanking current customers for their business, or promoting your next deal. If you want to really connect, include a photo of employees in holiday garb or add in a personal detail like the customer’s name. 5. Give back to a cause. Like we said, ‘tis the season of giving. Show how much you or your small business care by using the holidays as a chance to give back. Offer up a promotion to consumers where a percentage of every purchase goes toward supporting a local cause. Or, establish a partnership with a local nonprofit and give to them this season. Giving back not only makes you more relatable with your customers, but it shows you truly care about the giving season. 6. Share a festive video. Video is quickly becoming the newest and most effective way of marketing. Put together a creative video of you or your employees spreading holiday cheer this season. Whether the video is targeted for a specific purpose—for instance, sharing about an upcoming sale—or just a fun post on social media, utilize video to promote your business this season. 7. Throw a holiday party. Finally, throw a holiday party for everyone involved in the business or your professional life. This might sound expensive, but it doesn’t have to be anything too fancy—and building those relationships now will only continue to give back in the future. Invite potential partners, customers and friends and family for a fun night of merriment and networking. This holiday season, take advantage of valuable opportunities to market your professional products or services. Utilize some of these tips in your next marketing campaign to reach out and grow your business.